I am (mostly) feeling better and am back on my feet. I tackled our bedrooms and our downstairs closet this week. Everything looks so much more organized. I was able to store some items for my youngest daughter to grow into, donate some things that no longer work for our family and return a few pieces of clothing to people who generously handed them down to us. I tackled my nightstand and half of the closet first. I donated a few books and the odd piece of clothing. I mostly straightened up and cleaned. I went through my oldest daughter's closet next. I boxed up clothes that she has that will fit her in the coming season and boxed up shoes that she still needs to grow into. 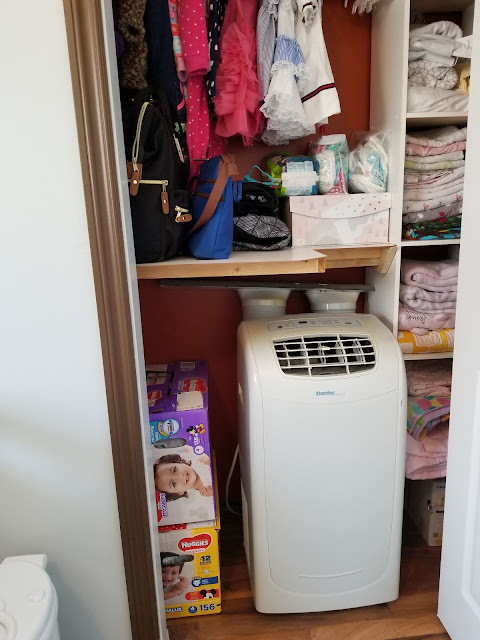 This helped to remove the visual clutter of the clothes piled on the shelves. I boxed up any items that were too small that we plan to keep for my youngest. I then donated or returned anything else we didn't want to keep. I took out her art project box and we are now slowly going through the task of gifting her art pieces to family and deciding which few are truly keepers. My youngest daughter shares a closet with our portable air conditioning unit (it is the easiest place to store it for the winter). I took out any items that she has outgrown or no longer uses. She just turned a year old so there was quite a bit of "baby" stuff that she simply doesn't need/use anymore. I advertised 2 of my diaper bags that I don't use (I really love my backpack diaper bag with my neck and shoulder issues). I boxed up the clothes that she will be able to use in Spring/ Summer and stored the rest the clothes that she needs to grow into in the downstairs closet. I tackled the downstairs closet last. I put all of my maternity and postpartum wardrobe together in a storage container in the closet. 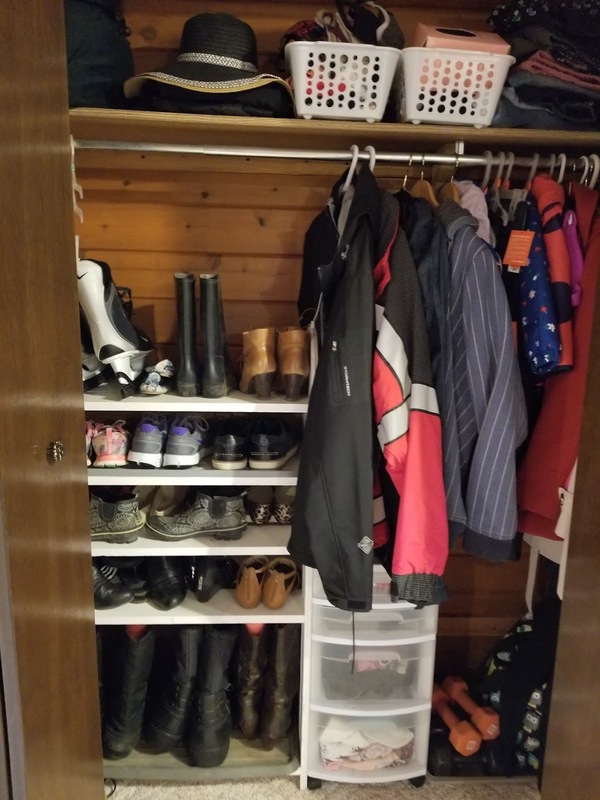 I also stored all of the clothes that my youngest daughter has to grow into in this closet. I use diaper boxes because they are economical and a nice size. We keep our off-season clothes in this closet so I went through those and only kept what we truly use. I keep the unused portion of my wardrobe in the downstairs closet. It mostly consists of my work clothes (which I am not using while on maternity leave), tops that currently don't fit or work because I am breastfeeding, bras that don't currently fit because I am breastfeeding and my summer outfits. I own a range of sizes in my outfits, but until I am sure we are done having children I plan to keep my clothes. I have worn almost the whole range of my sizes this year and when I finish breastfeeding, many of my tops will fit me again. I did donate a few articles of clothing that I never choose for my capsule wardrobes and a pair of shoes that doesn't fit me properly. Remove all of the items from the bedroom closets and dressers. Make sure that each item that returns to the closet/dresser truly belongs there. Wipe down light switches, door knobs and furniture. Move furniture to vacuum the floors. I am excited to finish tackling the rest of my house! Happy cleaning, friends!